This is a handsome watch. The leather band was a little stiff at first, but is becoming more pliable with use. 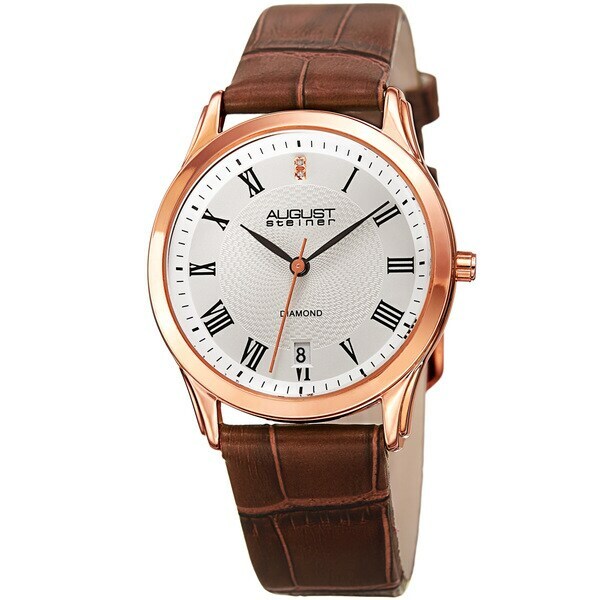 This finely crafted August Steiner watch features two dazzling diamond markers and an embossed leather strap. Powered by a precision quartz movement, the beautifully patterned inner dial and slim leaf style hands add elegance to this trendy timepiece. Exactly what I wanted. Sturdy strap. Large enough without being overpowering. Sent it back, the date hand did not work with the supplemental insurance I bought for it. Asked for the date hand to be fixed and the "leather wristband". The wristband was not changed. Beautiful timepiece. Quality craftsmanship. The band is a good length, however the color is actually much lighter than pictured. I was expecting a darker color. It looks more tan than brown. Otherwise, I am happy with purchase. Love the size of this watch and the face. Looks classy! Love the face and size, my 6th watch since I change according to outfits. Love the wife band and color. Nice watch! Awesome watch. Very light in weight. And easily readable. I liked the clean looks of the watch. Also liked the Roman numerals on the watch.